Whither the indie record store? Ruminator Books, the nationally-recognized independent bookstore on the Macalester College campus in St. Paul, is closing. After a series of financial problems and several attempts to find solutions, Macalester College has terminated the bookstore's lease. Book lovers say Minnesota is losing a piece of its literary history. St. Paul, Minn. — Ruminator Books founder and owner Dave Unowsky is looking for a job. "My 34 years of experience, and my connections, ought to be worth something to somebody, so I'll be out there, shining up my resume soon," Unowsky says. In the middle of a sunny afternoon, Ruminator is doing a brisk business. That's because all the books in the store have been marked down by as much as 80 percent. Sitting in the back room in a t-shirt and shorts, a cup of coffee in hand, Unowsky says the irony is not lost on him. "Today is a very exciting day. The press have been here, and people have been calling me from all over the country wishing me well, and asking me what I'm going to do, and wanting to know what happened," Unowsky says. "It's very rewarding in some ways, but it's a pretty sad day." David Unowsky opened what was then called the Hungry Mind bookstore in 1970. The store's bread and butter was college textbooks, t-shirts and mugs, which it sold to Macalester students and families. But the store quickly developed a reputation for hosting important Minnesota and national authors, and for keeping a diverse range of writers on its shelves. Linda Myers, executive director of the Loft Literary Center, says people who care about books in Minnesota are all very familiar with the Grand Ave. store, and recognize it as an important part of the community. But Myers says many people won't even notice Ruminator's departure -- and they'll never know what they missed. "Just the old-fashioned feeling of grabbing a book, sitting on a lumpy old sofa, or sitting in a creaky wooden chair at one of those little tables -- and feeling perfectly at home. And that's gone," says Myers. Early on I thought I was a great book buyer, because when I ordered a book from a publisher I knew which customer was going to come in and want it and I could put it in their hand. No chain bookstore can do that. 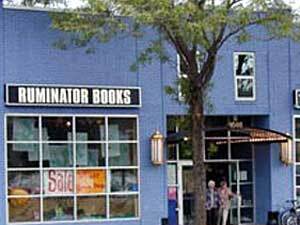 Ruminator is the latest in a long line of independent bookstores that have closed in recent years. Myers points to the rising popularity and power of large chain bookstores as one factor that led to Ruminator's demise. Author and bookstore owner Louise Erdrich agrees. She says in a time when a diversity of ideas is more important than ever, bookstore chains are crushing the competition by keeping a narrow focus. "They're going to set before you whatever book has been determined to be the most amusing book, and which book will make the most -- will make some cash. That leaves out a great deal of information," she says. Erdrich says as a reader, she feels a sense of defeat at the loss of Ruminator Books. But she doesn't translate that sense of defeat into worry over her own store, Birch Bark Books, in Minneapolis. She says by staying small, and focusing on her niche market of Native American writers, she's confident the store will stay strong. Perhaps Ruminator Books' fatal mistake was that it didn't stay small. When Open Book, a center for book lovers in Minneapolis, opened its doors, Unowsky started a second, smaller Ruminator there. The other tenants -- the Loft Literary Center, the Minnesota Center for Book Arts and Milkweed Press, thrived in the new environment. But the little bookstore never got off the ground. Unowsky admits it was a mistake. "I realize now that I'm not somebody that should have ever had two stores. I need to have a store that I'm here at, and know what's going on, and keep it smaller -- so that I'm in touch with the staff," Unowsky says. "I'm not very good with a large table organization. Hindsight's 20/20 as I say, and I guess I would have been better off to stay doing what I knew how to do better." Ruminator sold its original name, The Hungry Mind, to an online university in 2000 and used the profits to stay afloat. As finances got worse, and Ruminator's credit with distributors declined, Macalester College ended its textbook contract with the store. Instead it opened its own campus bookstore. This was a blow to Ruminator. Unowsky tried various measures to get back in the black. Writers donated items for an auction, people bought shares in the store. But it was too late. At the last minute, an anonymous donor entered into negotiations with Macalester. After a couple of false starts, Macalester ceased negotiations, and told Unowsky that he was in violation of his lease. Having failed to make regular rent payments, he would have to leave. Macalester Vice President and Treasurer David Wheaton says it's a sad loss. "They've been part of Macalester, part of our neighborhood, for a very long time, so we're sorry to see that Ruminator won't continue to work locally. Our students bought their books there, some of our students were employed there, I think, at various times when they were undergraduates," says Wheaton. "So the loss of the Ruminator is a loss for Macalaster and the neighborhood, and I think for the larger literary community." Wheaton says over the summer, Macalester will look at options for the building and its parking lot directly across the street. Ruminator Books owner David Unowsky says he suspects the college administration already has something in mind. Unowsky says he's thankful to his clients who have stayed faithful over the decades, and hopes once Ruminator is gone they'll continue to shop at independent bookstores. "The buyers for Barnes and Noble and Borders are in Ann Arbor and New York, and they don't interface with people every day who are buying books like I do," Unowsky says. "That's why early on I thought I was a great book buyer, because when I ordered a book from a publisher I knew which customer was going to come in and want it and I could put it in their hand. No chain bookstore can do that." Ruminator Books needs to be out of its building by the end of July. Unowsky plans to hold a wake for the bookstore on July 25. Until then, it continues to host authors and other literary events. Minnesota poet and author Robert Bly reads Tuesday night.